Muslims gathering for prayer in Msida have insisted that they do not expect the government to provide them with space to pray, but simply want greater cooperation over permits to regularise their own premises. 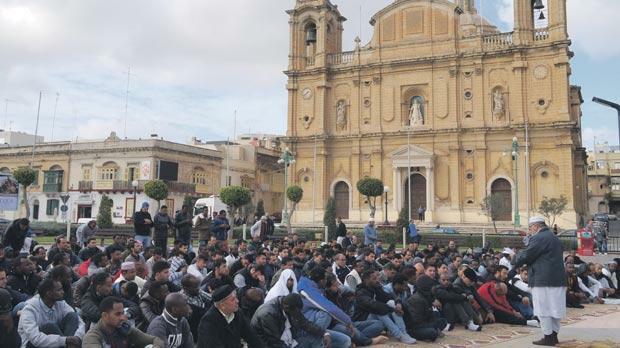 Some 200 Muslims have met in a square close to the Msida parish church for Friday prayers over the past few weeks, having been evicted from several meeting places around the island due to a lack of permits. The prayers prompted a protest last Sunday by members of the Għaqda Patrijotti Maltin, who accused the Muslim group of provocation and claimed they should not be allowed to pray in public. Malta Muslim Council spokesman Bader Zina, however, told this newspaper yesterday that the prayer meetings were not intended to antagonise anyone, but simply to draw attention to the needs of the group for a centrally-located meeting place. Mr Zina said the group had recently been denied a permit to change the use of a large garage in Santa Venera to be used for prayers, against the recommendation of the Mepa case officer, and had also been evicted from a building in Msida last month. Muslims are obligated by their religion to meet communally for prayers, but according to Mr Zina, the Paola mosque is too far away for people living or working in the north of the island to reach during working hours. Moreover, the existing mosque is too small for Malta’s growing Muslim population. Even a small open outdoor space at the mosque, highlighted in sections of the media as a possible place to pray, was always packed with cars at prayer times, Mr Zina said. The group is still operating a few prayer locations, but without cooperation from the authorities, they fear they could be shut down at any moment. Responding to concerns raised during Sunday’s protest, Mr Zina said he understood people’s fears in the current climate, and admitted that the community could do more to promote understanding of its beliefs. The topic will be debated on Times Talk at 10.05pm this evening.